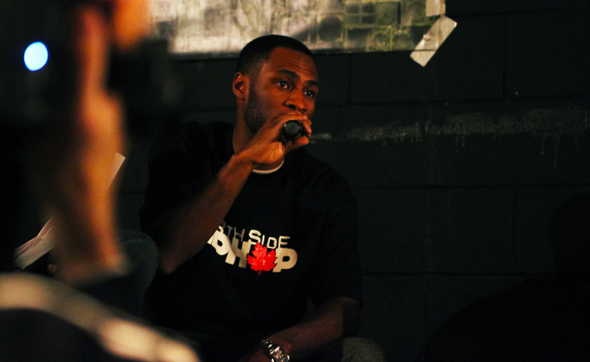 Thursday night marked the official launch of Northside Hip Hop, a multimedia-rich website that ambitiously aims to archive Canada's contributions to the global hip hop scene in the past 30+ years. Featuring contributions from Halifax to Vancouver, the website is a "living archive" that catalogs Canadian hip hop culture both past and present in order to bring generations together and pay the proper respect to the forefathers of the movement. 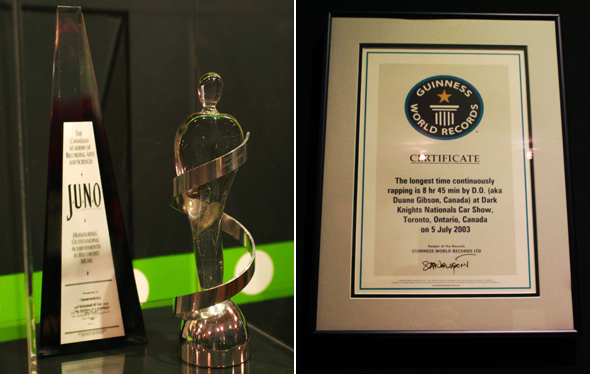 A gallery exhibit entitled T-dot Pioneers was created to coincide with the launch of the site. In the words of project coordinator Mark Campbell, the exhibit "is a sample, a small and humble segment of a much bigger landscape, yet representative of that whole's essence." Very much a community initiative, both the site and gallery are the products of years of research that highlights Canada's role in hip hop's international expansion throughout the early 80's and beyond. For Campbell, the exhibit signifies our city's collective refusal to "think of hip hop solely as a commodity and to remind us all that hip hop is art." 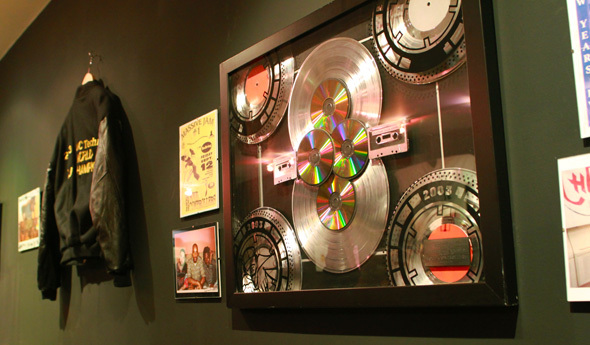 Taking place at the Toronto Free Gallery, T-dot Pioneers offers a collection of plaques, awards, flyers, posters, newspaper articles, vinyl recordings, cassettes, clothing, comics, archival video from b-boy battles, rare audio footage from community radio shows and more. With contributions from countless hip hop culture enthusiasts, the exhibit offers an "incomplete time line" that encourages community participation. "T-dot pioneers refuses the erroneous assumption that history (or herstory) can be told, documented or analyzed by any one person. Instead, the "incomplete time line" recognizes and pays homage to the multiplicity of herstories, voices and experiences inherent in the culture." 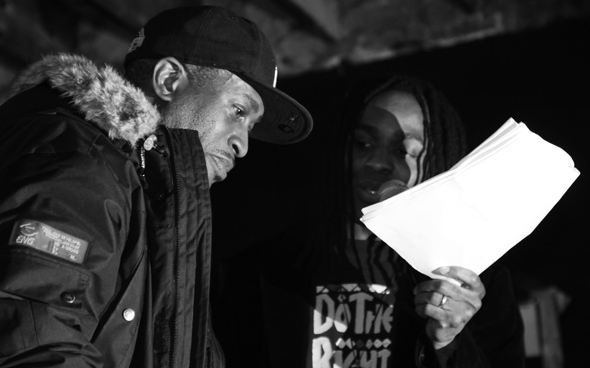 In addition to the exhibit, a series of free events and panel discussions have been organized at Toronto Free, the first of which was on Thursday night and featured a keynote speech from hip hop impresario K4ce (aka Mr. Force) as well as performances by Thrust, Kamau and many more. I squeezed into the gallery for K4ce's speech, eager to expand my knowledge and understanding of hip hop from a local perspective. 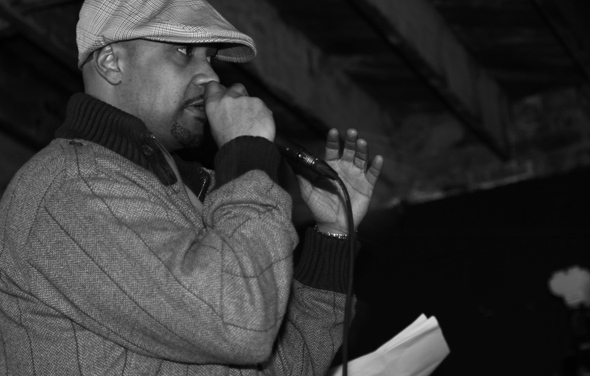 Responsible for originally coining the term T-dot, K4ce is a respected veteran of the hip hop scene. K4ce spoke of how under appreciated the local scene is, having remained a wealth of largely unrecognized natural talent for decades. He believes that this may soon change, as Drake's new found success with Lil' Wayne's Young Money crew down south has drawn a lot of attention to the scene up north. "Drake is sayin' Wayne, you can put that on tape." Lamenting over the lack of industry interest in Toronto's hip hop scene, K4ce notes that many hip hop and R&B artists in Canada (Drake included) have resorted to heading south of the border to find their big break. This trend has bittersweet repercussions -- local talent like Drake explodes in the U.S. and reps T-dot wholeheartedly, but he had to go America to get the recognition. Campbell states that "it's time to flip the script and remix the stale Toronto/New York narrative." With hopes of bringing all of the elements of a diasporic culture back together, Campbell wants future generations "to witness the culture and not just its consumable elements." Check out the T-dot Pioneers exhibit at the Toronto Free Gallery (1277 Bloor W. at Lansdowne) until April 18, 2010. "When Rappers Used to Dance" is the final panel and discussion of the exhibit, taking place on Saturday March 27 from 2-5pm. The discussion aims to explore the emergence of the bling era and the importance of dance to an MC's persona. Panelists include Rinaldo Walcott (U of T), DJ Grumps (Bigger than Hip Hop radio show), Citizen Kane, Ian Kamau, Ty Haper (OTA Live) and more. Photos & words by Matthew McAndrew.